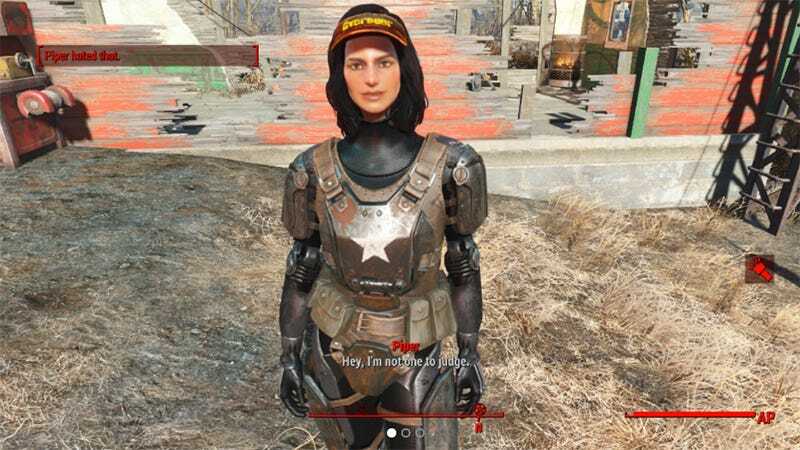 Fallout 4 update 1.8 went live yesterday, bringing with it the long-awaited ability for PlayStation 4 players to use mods. Nearly 200 game tweaks are now live for the PS4, and many of them actually work. It’s a process, really. As with any brand-new functionality, there are bound to be some snags. For example, Neeher’s Firelance weapon mod looks like an ordinary weapon instead of its PC version, as custom textures can’t be applied. Also some folks are reporting it has no sound. Or just doesn’t work at all. Might be a mod conflict. Basically, as mentioned back when PS4 mod support was confirmed again, any mod that tries to use external assets probably won’t work. Like natezilla11's Gold-Trimmed Power Armor mod, which it doesn’t seem like anyone is getting to work properly. So what does work? Technically, any mod that relies on preexisting models and textures should be doable, or mods that tweak code without requiring physical assets. D0c_shock’s Pleasing Piper Attitide Adjuster doesn’t seem to have any complaints. Masternips’ Dismemberment Overhaul, which allows everybody to lose limbs, has been downloaded nearly 10,000 times and seems fine, though there was a problem with headshot deaths that required a new version. The basic rule of thumb here is to check out the comments section of any mod you plan on downloading over at Bethesda’s Workshop site. With mod-hungry PS4 Fallout 4 players grabbing files left and right, download numbers aren’t a good indicator of mod success. And don’t get too excited about Guidion’s Birthday Suit mod. It’s just underwear.